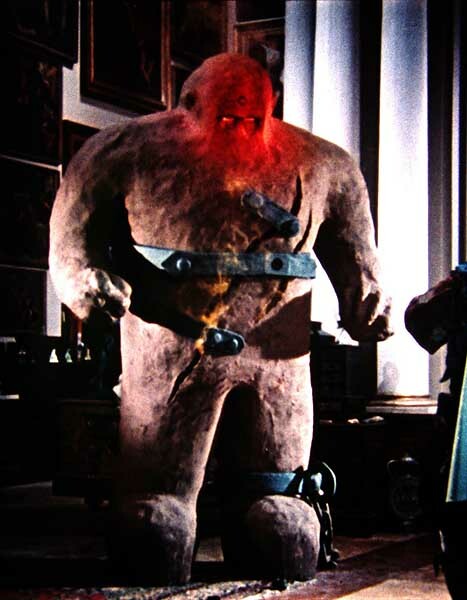 For those unfamiliar with a "Golem", or confused by similar sounding characters in books and motion pictures. Specially J.R.R. Tolkien's character of "Gollum". This blog article is about the statue made out of either clay, or mud brought to life in Jewish folklore by "the word of God". For my readers unfamiliar with the word "Talmud" used in the above paragraph. The Talmud is a collection of writings made from Oral traditions dating back to 536 BC. The Hebrew word Talmud means "instruction, or learning". In the above translation "Unformed Body" is actually the modern translation of the Hebrew word "Gaimi (My Golem)". The above paragraph also referred to the Prophet Jeremiah credited in Jewish tradition as the author of :The Book of Jeremiah", the "Books of the Kings" and the book of "Lamentations". The paragraph references the Talmud mentioning Jeremiah may have created a Golem. We know he was a Prophet from 636 BC. to either 587, or 595 BC. and the creation would have fallen sometime within those years. And I have heard, in a certain and explicit way, from several respectable persons that one man [living] close to our time, whose name is R. Eliyahu, the master of the name, who made a creature out of matter [Heb. Golem] and form [Heb. tzurah] and it performed hard work for him, for a long period, and the name of emet was hanging upon his neck, until he finally removed it for a certain reason, the name from his neck and it turned to dust." The above translation is found in Moshe Idel's 1990 work: "Golem: Jewish Magical and Mystical Traditions on the Artificial Anthropoid". Rabbi Elijah Ba'al Shem lived in the city of Chelm (Shem) in Eastern Poland. He was born in 1550 and died only 33 years later in 1583. In my opening paragraph he is described as a "Gaon". That Hebrew title was given to scholars and spiritual leaders. In short he was a "Rabbi'"
Which needed to be removed to stop the Golem by turning it into dust. The word EMET translates from the Hebrew as TRUTH. He then removed the Holy Name embedded on his forehead. Hebrew words are read right to left. The second major point is found in the 1748 translation and indicates the fear and power of the Golem. Even though it was made either of clay, or mud. When the Gaon saw that the Golem was growing larger and larger, he feared that the Golem would destroy the Universe. "Destroy the Universe" is surely, to the very religious mind, the power of God Almighty. Whose word "Emet" the Golem had upon it. As I wrote this account took place in the city of Chem (Shem) in Poland. The Polish Golem was not the only account passed down. This tale is the most famous and revolved around Rabbi Judah Loew ben Bezalel. He was born either in 1512, or 1526 and died in 1609. The Rabbi is known as either the "Maharal of Prague", or just "The Maharal". The word is derived from a Hebrew acronym "Moreinu Ha-Rav Loew (Our Teacher, Rabbi Loew)". The other person involved in this tale was Rudolff II, the Holy Roman Emperor from 1576 to his death in 1612. Rudoff II had been elected King of the country known, then, as Bohemia and made Prague his capital in the same 1576. Above a painting of Rudolff II. There are two versions as to why "The Maharal" created his Golem to defend the Jewish Ghetto in Prague. Both have to do with edicts and actions of the "Holy Roman Emperor". The first version resulted from the general Anti-Semitic attacks and pogroms of the Emperor. A "pogrom" is basically the persecution of a particular ethnic group approved by the local authorities. The other was that by specific order of Rudolff II. All Jews were to be exterminated within the city. According to the story mud from the Vltava river was formed into a Golem by "The Maharal" and brought to life through rituals and Hebrew incantations. The Golem was named "Joseph" and was known to the Jews of Prague as "Yossele" in Yiddish. According to the tale he could make himself invisible and summon spirits of departed love ones. This Golem had been brought to life after the Rabbi placed the "Shem", a parchment, with "Emet", "The Word of God", written upon it in it's mouth. "Joseph" would be deactivated, by removing the "Shem", at sundown on Fridays to observe the Jewish Sabbath and reactivated at sundown Saturday night. As the tale goes one Friday evening "The Maharal" forgot to remove the "Shem" and became fearful that "Joseph" would desecrate the Sabbath and become wild. Another version has "Joseph" falling in love with a girl and being rejected. He then goes on a rampage and the Rabbi is able to finally remove the "Shem" causing "Joseph" to break apart. The story further states those pieces were hidden in the attic of the "Old New Synagogue" until the time the Jews of Prague would need defending once again. The synagogue was originally built in 1270 and called "The New, or Great Synagogue". In the 16th Century when more synagogues started to be built. The name was changed to "The Old-New Synagogue". It is still in use today. As to that attic. No one is permitted to enter it, but it is said there are no pieces of "Joseph" stored there anyone. A story is told that during World War 2 a Nazi agent was sent by Hitler to investigate the truth of the tale. He entered the attic one night and found "Joseph" defending it. The Nazi Agent attempted to stab the Golem to death, but was instead killed himself. Another story states that "Joseph's" body parts were removed and buried in a graveyard in Prague's Zizov District. Today the Zizov Television Tower stands upon "Joseph's" grave and he awaits. Above the statue of Rabbi Loew in Prague's new town hall. Below an 1899 drawing of Rabbi Loew and "Joseph". Before I move to the filmed versions of this tale. There are other variations of both the "Shem" and "Prague" stories concerning the destruction of the Golem. In these variations the Golem is stopped by removing the first Hebrew letter in the word "Emet" leaving "Met". "Met" in Hebrew means "DEAD". A trilogy about the Golem was produced in Germany. It is true that all three movies had Paul Wegener the same looking Golem, but that was the only reason for calling the three films a true "Trilogy". 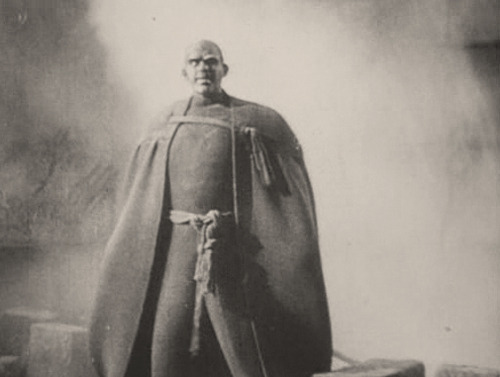 The first motion picture came out in 1915 and was entitled simply "Der Golem (The Golem)", This silent feature would be shown in the United States as "Monster of Fate". Paul Wegener was a German film writer, actor and director during the Expressionist Period of film making in Germany. Paul had started out to be a lawyer, but dropped that field for the legitimate German stage and became an acting student of the famed Max Reinhardt. Reinhardt's other acting students would include Marlene Dietrich, Paul Heinreid, Kurt Kazner, Hedy Lamarr, Francis Lederer (read my article on this forgotten "Dracula"), the director F.W. 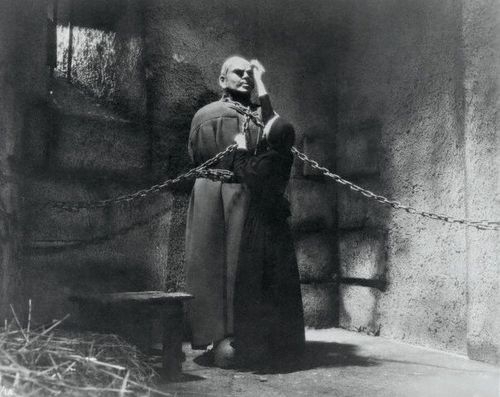 Murnau (1922's "Noseferatu), and Conrad Veidt (1920's "The Cabinet of Dr. Caliagari" as "Cesare"). Reinhardt like many Jews in the German film industry such as Fritz Lang, Peter Lorre and Curt and Robert Siodmak, (All have blog bio's by me), fled the country at the rise of Adolph Hitler. Paul Wegener was not Jewish and remained in Germany after Hitler came to full power. Wegener had become a Nazi "State" Actor and made propaganda and other films. In appearance he was a perfect member of the "National Socialist Party", but in reality Paul Wegener was giving money to German Resistance Groups, hiding people the Nazi's were looking for and actually writing anti-Nazi slogans on walls. The first photograph in this article is that of Paul Wegener in the 1920 film. The following still is from the earlier 1915 motion picture. The set up with the mirror makes the scene perfect cinema for the period. The 1915 film's plot is a variation of the Prague Golem love story I mentioned above, but set in modern Germany. An antiques dealer finds the statue of the Golem. The dealer named "Troeder" was played by Henrik Galeen. "Troeder" traces the history of the clay statue and learns how a Kabbalist Rabbi brought it to life four centuries earlier. He recreates the ritual and makes the Golem his servant. However, in the household is "Troeder's" wife "Jessica" portrayed by Lyda Salmonova seen above. Salmonova was both Paul Wegener's third and sixth wife. In the film the Golem falls in love with "Jessica", is rejected, and goes on a murder spree as a result. 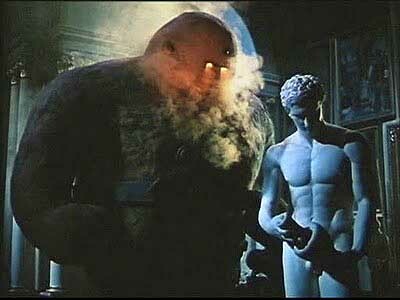 The "Word of God" is removed at the climax making the Golem once more a inanimated clay statue. Besides acting in the 1915 feature. PaulWegener and Henrik Galeen co-wrote and co-directed it. Seven years later Galeen was hired to write a version of Bram Stoker's novel "Dracula". 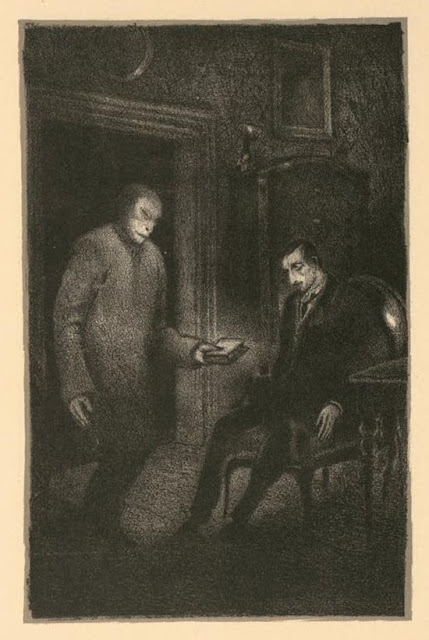 He wrongly believed the novel to be under copyright and rewrote it as "Nosferatu" for F.W. Muranu. The German theatrical profession was a close knit group and Henrick Galeen was also a student of Max Reinhardt. As was Max Schreck who played the "Dracula" character. Below is an ad for the picture used in the large Jewish neighborhood of New York City? Paul Wegener and his wife Lyda Salmonova were back together two years later for 1917's "Der Golem und die Tanzerin (The Golem and the Dancing Girl)". The above poster and the following still are the only known images of this lost motion picture. Which apparently was a movie short and not a full feature film.. It was not a sequel to the 1915 motion picture and only contains the character's costume standing on the left in the photo. Maybe! Movie historians have been told the feature was a comical parody of the 1915 film and Paul Wegener played himself. He sees the Golem costume and decides to put it on as a joke, but unexpected results take place. What they were there is no record. Some sources indicate Rochus Gliese also played the Golem. Rochus was the future Academy Award winner for Best Art Direction for the 1927 motion picture "Sunrise". As "The Golem and the Dancing Girl" is alleged to be a comedy. Perhaps some of the comedy resulted in there being two Golems as those unexpected results. One fake and the other real? Just speculation on this blog writers part, but a possibility that might explain two actors in the same role. I imagine something like what happened with three Mummy's, two fake and one real, in 1955's "Abbott and Costello Meet the Mummy". 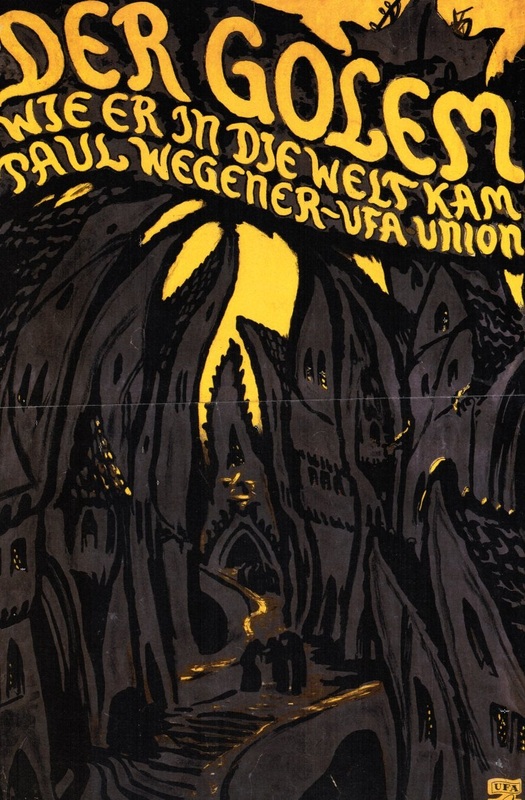 The third film in Paul Wegener's "Trilogy" is considered a classic piece of silent film horror and inspired sequences in a 1931 Universal Studio horror classic. 1920's "Der Golem, wie er in die Welt kam (The Golem: How He Came into the World)" takes place in medieval Prague and tells the story of Rabbi Loew. 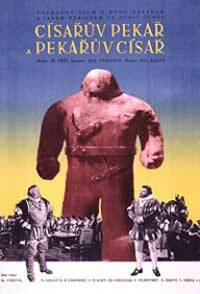 The movie is known today simply as "The Golem" and was restored in 2004 for DVD release. This feature film is actually a prequel to the 1915 motion picture and was written by Wegener and Galeen. Paul Wegener was, once again, the Golem and his wife, Lyda Salmonova, portrayed "Miriam" the daughter of "Rabbi Loew". The role of "Rabbi Loew" was portrayed by Albert Steinruck. The plot closely follows the Prague Golem story. The film opens with Rabbi Loew reading the stars and informing the Jewish elders that a disaster is about to fall on the community. The Holy Roman Emperor passes a decree that all the Jews must leave the city before the new Moon, or he will send soldiers in to the Ghetto to force them to leave. The Rabbi creates the Golem out of clay from the river to protect the Jewish population. Below "Rabbi Loew" and his unnamed "Assistant" played by Ernst Deutsch. Meanwhile the Emperor has sent the "Knight Florian", Lothar Muthel, to see that his decree is carried out.. "Florian", although not Jewish, will fall in love with "Miriam". The screenplay changes the story of the creation of the Golem. In it "Rabbi Loew" uses "The Book of Abrameiln" to call upon the spirit of "Astaroth", a demon, to help animate the Golem. The book was very popular at the time in Germany, but the translation from the original Hebrew was wrong. The incorrect translation was by Samuel Liddell MacGregor Mathers and entitled "The Book of the Sacred Magic of Abrameiln the Mage". The real Abramelin (Abraham) lived in the town of Worms, Germany, possibly between 1361 to 1458. His writings were based upon the mysticism of a Jewish Priest from ancient Egypt. In the picture "Loew" also requires the help of his "Assistant" to bring the Golem to life. The spirit of "Astaroth" appears and gives "Rabbi Loew" the magic word needed "Emet". It is placed on a piece of parchment paper and put inside an amulet. The amulet is placed upon the Golem's chest bringing life to the clay. The shape is misleading and is not a "Star of David" as some have assumed. 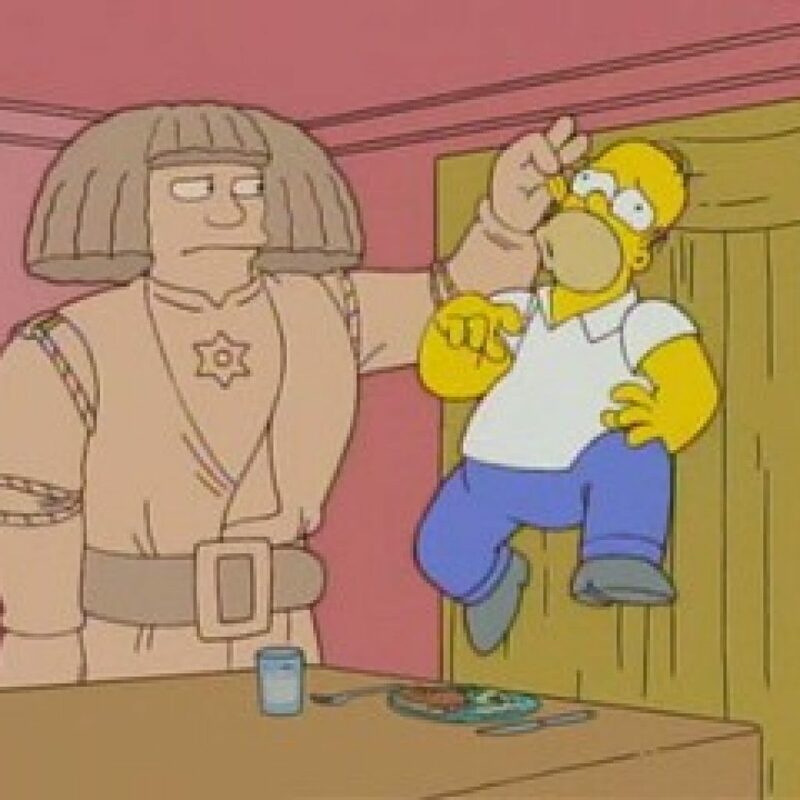 "Loew" is summoned to the palace by the "Emperor", Otto Gebuhr", and decides to bring the Golem. The court is both terrified, but intrigued by the creature. Meanwhile "Florian" has gone to meet with "Miriam". However, her father has instructed his "Assistant" to watch over the girl. At the palace "Loew" in an attempt to influence the "Emperor" tells the court the history of the Jewish people by using a magical screen and instructs the court not to make any noise. When the Rabbi reaches the point in his tale about the story of "The Wandering Jew". The court breaks out laughing over it and suddenly the palace begins to crumble. The Golem saves them by holding up the roof. As a reward the "Emperor" will not exile the Jewish population of Prague. "Rabbi Loew" returns to the Jewish Ghetto to inform the people they will not have to leave. A celebration begins in the streets and "Loew" removes the piece of paper from the amulet and the Golem is just a statue. However, his "Assistant" goes in search of "Miriam" and discovers her in bed with "Florian". The "Assistant" reanimates the Golem and instructs it to remove "Florian" from the "Rabbi's" house. A problem arises, because the well meaning "Assistant" can not control the "Spirit of Astaroth" within the amulet. Instead of taking "Florian" out of the house and into the street as the "Assistant" thought would happen while scaring the man away for good. The Golem takes "Florian" to the roof of the house and throws him off of it. Horrified over what has happened the "Assistant" runs to the Synagogue to get the "Rabbi". When the two return the Golem has set fire to the house and "Miriam" is now missing. The Golem is causing destruction to the Ghetto while dragging "Miriam" around by her hair. The "Rabbi" performs a ritual and removes the influence of "Astaroth". The Golem suddenly stops, leaves "Miriam" in the street, and heads for the Ghetto's gate. At this point I want to bring up the name of the Cinematographer for the motion picture Karl Freund. Freund is best known for his cinematography on Fritz Lang's "Metropolis". In 1931 he was cinematographer for Tod Browning on "Dracula". In which, without screen credit, he actually assisted directing. In 1932 Freund was both the cinematographer on "Murders in the Rue Morgue" and directed the "The Mummy" starring Boris Karloff. In 1935 he also directed the Peter Lorre vehicle "Mad Love" while also being the films cinematographer. After the Golem breaks through the Ghetto's gates he comes upon a group of children. All but one little girl run away. In the 1920 "Golem" she holds an apple for Wegener. 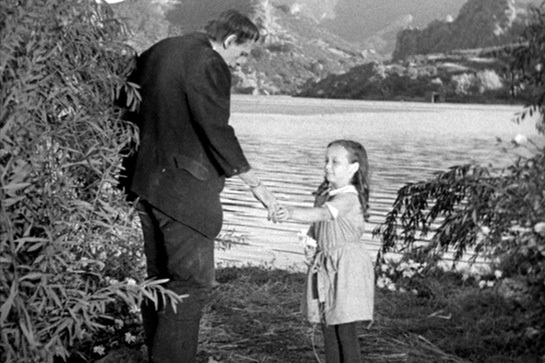 In the 1931 "Frankenstein" the girl holds a flower for Karloff. The influence of the 1920 film on Whale is obvious throughout "Frankenstein", but it is this scene that film historians bring to the forefront. 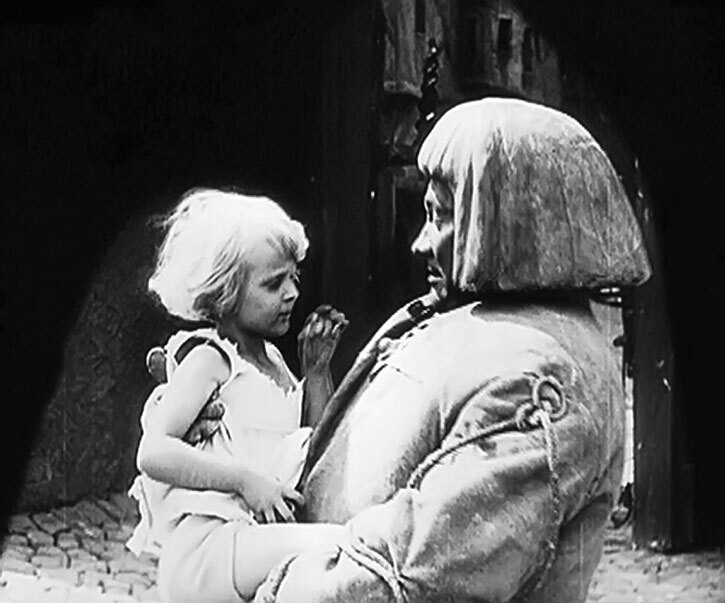 The only real difference is the little girl is accidentally killed by the Monster (Golem) in 1931. While in 1920 it is the little girl who removes the amulet ending the living state of the statue. I would point out that it has long been believed that Mary Wollstonecraft Shelley used the legend of the Golum for the basis to build her novel "Frankenstein, or the Modern Prometheus" upon. The influence of Paul Wegener's version of the "Golem" has remained throughout the decades and even "Homer Simpson" came face to face with it. The scene below is from "The Treehouse of Horror XVII" on November 5, 2006. The episode was entitled "You Gotta Know When to Golem". 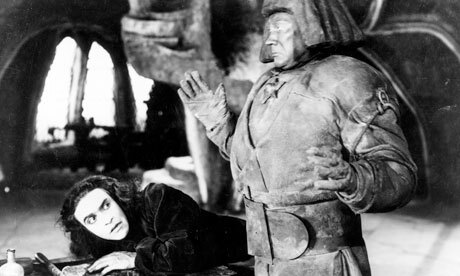 In 1936 the first sound film about the Golem was released. The motion picture was a French and Czechoslovakian co-production and is considered a sequel to the 1920 German motion picture. Except "Rabbi Loew" is now "Rabbi Jacob" and his daughter "Miriam" is now the Rabbi's wife "Rachel". The movie is known by two names and has three different running times. 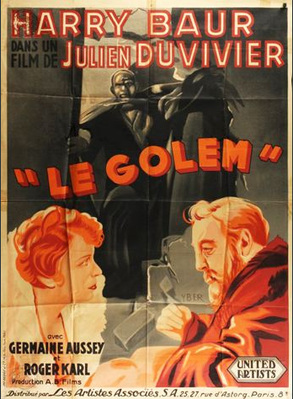 The original French/Czechoslovakian release "Le Golem" runs 95 minutes in length. It was released for a London premier in 1938 as "The Golem" with apparently the original running time. However, the general release in the U.K as. "The Legend of Prague" was cut to 83 minutes. While the version that was released in the United States under that same title in 1937 only runs 70 minutes. The film uses elements from both of the Golem histories I mentioned at the start of this article. The feature stars Harry Baur as "Rudolph II". Charles Dorat portrays "Rabbi Jacob"..
Below Roger Karl as "Chancellor Lang" and Germaine Aussey as "Countess Strada". The plot has the Jews in the Prague Ghetto being oppressed by "Rudolph". They want "Rabbi Jacob" to re-animate the Golem that is kept in an attic by the Rabbi. The Golem in this film is portrayed by Czech actor Ferdinand Hart. It has more of a human appearance than in the German silents. There is a riot over the lack of food and "Rudolph's" mistress the "Countess Strada" is rescued from the rioters by "De Trignac", Roger Cuchesne, who is in love with her. He has been injured and is taken to the home of "Rabbi Jacob" by the Rabbi's wife "Rachel", Jany Holt. "Rudolph" becomes engaged to his Cousin Isabel of Spain and this angers the Countess. She uses her charms on "De Trignac: to steal the Golem. The prefect of police informers "Rudolph" of the Golem's disappearance from the attic. 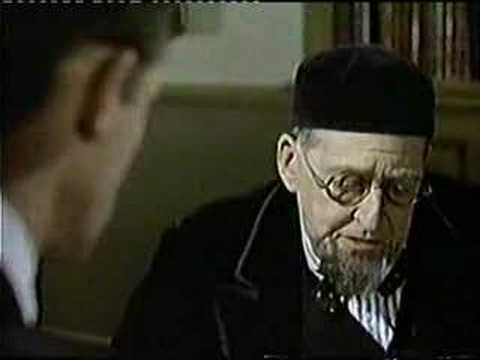 "Rabbi Jacob" is summoned to the palace and told if any Jews are found to have any relationship to the disappearance. They will be hung. 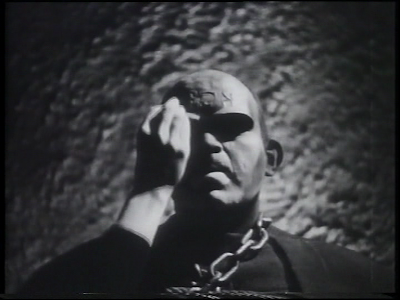 The Golem is found by "Rudolph" and chained in a prison cell in the palace dungeon. At which point "Rudolph" attempts to bring it to life. Not succeeding he starts torturing the Jewish leaders to either find out the means, or force "Rabbi Jacob" to bring the Golem to life to stop the torturing. "Rudolph" then imprisons the "Rabbi", but overlooks his daughter "Rachel". Where director James Whale's 1931"Frankenstein" borrowed from Paul Wegener's 1920's "The Golem". Here director Julien Duivier borrows from Whale's "Frankenstein" for part of his conclusion. There is one added factor to this story not in the originals. After the word "Emet" has been placed upon the Golum's head. It will not awake "Until the Beasts Roars". There just happens to be a cage of lions near the cell and "Rachel" makes them "Roar". The Golem for the last 15 minutes of the movie now comes to life. The Golem snaps its chains and with the freed lions roam the palace causing panic. "Rudolph" escapes as "Lang" and the others of the court are murdered by the living statue. Meanwhile "Rachel" rescues her husband and the other Jewish leaders. "Rabbi Jacob" erases the first letter of the word "Emet" on the Golem's forehead changing it to "Met" the word for "Dead". 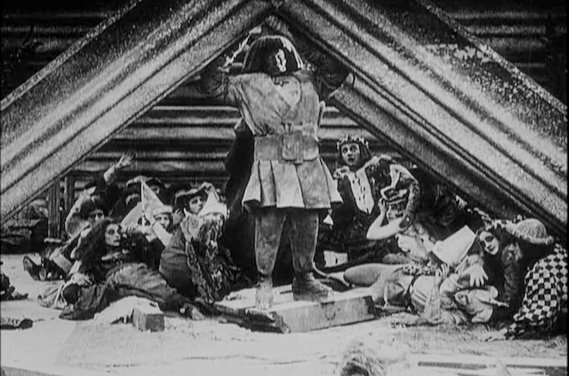 The Golem dissolves as the film ends with "Rudolph's" benevolent brother Mathias approached Prague to take over rule. The website "Films de France .com" has a review of this motion picture. They look at the way both "Rudolph III" and "Chancellor Lang" are portrayed as compared to two specific persons in Germany. ----is the obvious casting choice for the role of the debauched and ever so slightly deranged Emperor Rudolph II. Baur was always at his best in colorful roles such as this and his unashamedly over-the-top performance is the film's main delight--he is more frightening than the animated lump of clay of the film's title. Roger Karl is almost as chilling (with a genuinely creepy Nazi-like aura) as Baur's right hand man, Chancellor Lang. If we dare to liken Baur's Emperor Rudolph to Adolf Hitler, it naturally follows that Lang is Heinrich Himmler. The only thing preventing us from enjoying Le Golem as a wicked black comedy is the fact that it is so depressingly prescient of the fate that would befall the Jews in the ghettos within a few years of the film being made. This 1951 feature was made in Czechoslovakia and the literal translation of the title shown on the following poster is "Emperor's Baker - The Baker's Emperor". Like Paul Wegener's 1917 "The Golem and the Dancing Girl" this was partly a comedy, but with a Soviet Block political slant. The "Golem" is more an afterthought to lure audiences in. The picture was filmed in color which was unusual for Czechoslovakia at the time, but they were thinking of International Distribution. The original release "In Country" and within the "Soviet Block" was shown in two parts. The first ran 86 minutes and the second 69 minutes. For that International release the two parts were combined into a 112 minute Foreign language film with subtitles. The shorter running time, than the total of the two parts, was from the removal of 43 minutes of "Soviet Block" propaganda that included some songs. The setting for the feature is once again Prague under the rule of "Rudolph II" portrayed by Jan Werich. However, there is no Rabbi, or Jewish Ghetto/ The religious aspect of the Golem has been completely removed, after all this is from a Communist Country, with the exception of using the "Shem" to bring it to life. Part One has "Rudolph" obsessed over the idea of a Golem. Below actor Werich as both the Baker named "Matej" and "Rudolph". Think Mark Twain's "The Prince and the Pauper"
The first part has "Rudolph" with a group of comic alchemists all trying to impress him. One hit's a anvil with a hammer and claims to have split the Atom. Another is constantly experimenting by creating scientific machines. While in truth they are all new ways to cook sausage. Besides the Emperor the only other real life character is "Edward Kelley" played by Jiri Plachy. 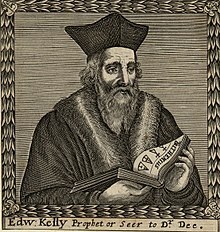 "Kelley" was a British occultist and self-proclaimed spirit medium. 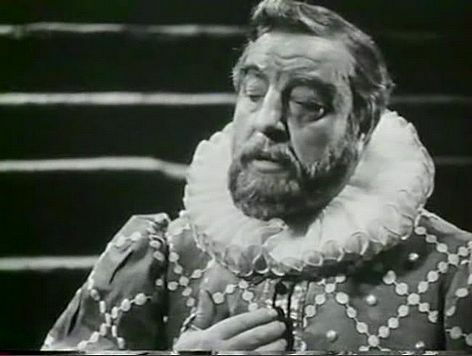 Below Jiri Plachy as "Edward Kelley" speaking to the Emperor. The baker enters the story by being overwhelmed with hungry citizens at his shop wanting bread and rolls, because of everything the baker is making goes to the Emperor. He decides to give them all the rolls and bread he just made for the Emperor. As a result the Baker finds himself arrested and in the dungeon. Meanwhile "Edward Kelley" reveals a Homunculus that he has created for the Emperor. The still below is of "Rudolph" and the Homunculus "Katelina" that has a split personality of "Sirel". "Katelina" is good and "Sirel" is evil. A little cinematic license is taken as a Homunculus is a very small representation of a human being almost being doll size. "Katelina" and "Matej" start communicating through vents in her room and fall in love sight on seen. A character named "Alessandro Scotta" creates an elixir of youth for the gullible Emperor. It is in actually some alcohol mixed with morphine and presents it to him. Thus ends Part One without seeing a Golem..
Part Two opens with "Rudolph" drinking the fake elixir of youth and falling asleep. This will begin a series of mistaken identities. The Baker "Matej" escapes from his cell and makes his way through the palace ending up in the Emperor's room and hides. "Rudolph" looking at mirror does not see himself, but "Matej's" reflection and thinks he's now young again. He gets his loyal servant and without telling anyone else the two leave for the countryside. "Matej" comes out of hiding just as other servants enter and believe him to be the now rejuvenated "Rudolph". They dress "Matej" as the Emperor and this starts the entire court believing that the Emperor is now younger, because he drank the elixir. The "Countess Strada" drinks the reminder of the elixir and promptly falls asleep. At this point all "Matej" wanted was to be with "Katelina", but suddenly seeing himself in the mirror realizes that he resembles the Emperor. With the Emperor gone "Matej" sets about to correct "Rudolph's" edicts for the good of the people. As this is taking place "Alessandro Scotta" knowing the elixir was fake joins with "Matej" to correct all the wrongs. The start by getting rid of all the people attempting to con the Emperor. Then "Matej" settles the affairs of the waiting foreign ambassadors whom "Rudolph" was just ignoring. Intrigue continues as "Edward Kelley", the Chamberlain "Lang" played by Bohus Zahorsky, "General Rusworm" played by Zdenek Stepanek and the "Court Astrologer" played by Frantisek Folipovsky plot to take over the country and assassinate the Emperor. "Kelley" wants to have the "Sirael" personality of "Katelina' kill "Rudolph". Who happens to be "Matej" at the moment. This back fires as the "Sirael" personality disappears. When "Katelina" and "Matej" can finally express their love for each other. "Kelley" awakes the Golem. The comical aspects of the motion picture are basically forgotten at this point. There is infighting between the conspirators and the General kills everybody and wants to use the now awakened Golem to take over the world. Only problem is the Golem will only follow the orders of the person who placed the "Shem" its mouth and the General has already killed him. The above is the Golem seen in the feature. It obviously has a human shaped body, but no features of identification as the previous versions have had. It also does not fit really the actual legends related to Prague. In some respects it's too cute to be so deadly. The General is killed by the Golem, but now it is on a rampage. The real "Rudolph II" returns to the chaos. "Matej" told "Katerina" and "Scotta" to go get help from the townspeople who arrive the same time as the returning Emperor. Our hero succeeds in removing the "Shem" from the Golem's mouth stopping him. 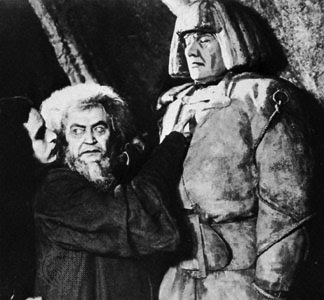 "Rudolph", now a changed Emperor, is reinstalled and "Matej" convinces him to give the Golem to the people. The film ends with "Matej" and "Katerina" running the bake shop making enough rolls and other bake goods for the city of Prague, the Emperor and his Court. Reason: the Golem is providing the heat for the oven and assisting the now married "Matej" and "Katerina". As they live happily ever after in 1951 "Soviet Block" contentment. Decades later the four-meter-high film prop, on the other hand, would generate a legal battle: the sculptor who designed the film’s golem, Jaroslav Horejc, had a daughter and she claimed the rights to reproduce its image. In the streets of Prague, in the wax museum, on corporate signage — you encounter the iconic figure simply everywhere. In 2010 a Prague court awarded her the copyright to the film’s golem, succeeding her father. The golem of Horejc’s sculpture was the first figure of this kind to appear without any human features, whose robotic image emphasized aspects of modern everyday reality. Horejc’s golem became a source of visual inspiration. Similar to Paul Wegener’s golem with the unmistakable hair-do, who re-emerged in the Simpsons episode You Gotta Know When to Golem , or to the ghostly figure from Hugo Steiner-Prag’s lithography, whom Lord Voldemort uncannily resembled in the Harry Potter films, Horejc’s steam-machine from The Emperor and the Golem established its very own golem stock look. This is one of the Golem drawings by Hugo Steiner from about 1915 referenced above. 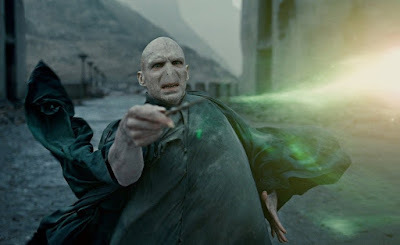 Followed by an uncanny resemblance of "Lord Voldemort" in the "Harry Potter" films. THE GOLEM MEETS ALFRED HITCHCOCK'S "PSYCHO"
The screenplay was written by Herbert J. Leder. He was a Professor in the "Media Art's Department" at "New Jersey City University" in New Jersey. His early 1950's television screenplays included episodes of "Captain Video and his Video Rangers" and "The Loretta Young Show". In 1958 Professor Leder wrote the screenplay for the very entertaining science fiction picture "Fiend Without A Face". Among his work as a director are 1960's "Pretty Boy Floyd" and 1966's "The Frozen Dead". Both from his own screenplays. That title that I originally viewed this motion picture under was simply called "IT!". Howver, the feature which Professor Leder directed had two additional titles "IT, Anger of the Golem" and "IT!, Curse of the Golem". The posters used for the original release were also throw backs to those 1950's American and British Horror films. As the above poster indicates the feature starred Roddy McDowall, He was one year away from the first of the original "Planet of the Apes" series and a major restart of his career. 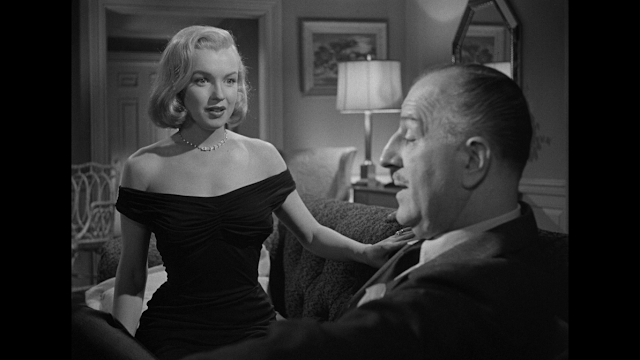 His co-star was actress Jill Haworth. Haworth had appeared in three major motion pictures. They were 1960's "Exodus", 1963's "The Cardinal" and 1965's "In Harms Way". Otherwise she was appearing in French films and American television. The plot uses the 1748 story and unlike the other films makes it clear that the Golem is indestructible and all powerful. The story opens with a fire at a warehouse for the "London Museum" that contains only items from Prague, Czechoslovankia. Everything inside has been destroyed, but somehow a statue remains as if the fire never happened. The curator "Harold Grove", Ernest Clark, and his assistant "Arthur Pimm", Roddy McDowall, are called by "Police Inspector White", Noel Trevarthen, and after introductions and a quick overview of the fire. The two are left alone to inspect the damage. After seeing the statue and noticing an inscription on the its side. 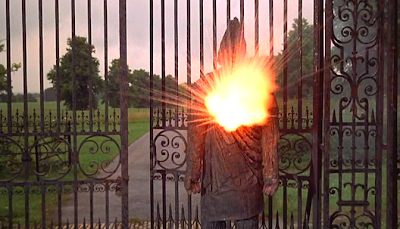 "Grove" sends "Pimm" to get a flashlight and as "Arthur" leaves there is a sudden scream and he returns to find "Grove" lying dead at the foot of the statue. Also the umbrella he saw "Grove" place across the statues arms is now impossibly on the ground. Looking at the statue the arms now appear to be in a different position from when the umbrella was first placed across them. Later when the 3,000 pound statue is placed in the museum/ The hands have returned to their original position and "Pimm" is still uncertain about what he thought he saw at the fire site. As written "Pimm" is definitely like Alfred Hitchcock's "Norman Bates", but so where many characters following the release of "Psycho" in 1960. Both William Castle's 1961 "Homicidal" and Hammer Films own 1963 "Paranoiac" go down the "Psycho" road .. In this film Roddy McDowall's "Arthur Pimm" keeps his mother's corpse in his apartment and talks to it as if she is still alive. While he "borrows" jewels and other items from the museum to temporary give to her. As in one scene discusses making diner for her and his day at work. This is billed as a horror film but it’s also a dark comedy. Roddy McDowell makes it a must see for anyone who likes to see an actor having a great time. He’s Arthur Pimm, an assistant museum curator with not just a screw loose but the whole hardware store. "Arthur" also is in love with the late "Harold Grove's" daughter "Ellen", Jill Haworth, and wants her to visit with his mother. In one sequence, after the Golem has killed, "Pimm" fantasies about "Ellen" only to have the vision turn into his mother's corpse. Returning to the statue. After it is first moved into the museum for display. "Arthur" finds two workers arguing and one tells him that they've never argued about anything before and he believes its the influence of the statue which is somehow evil. "Pimm" just thinks the worker is trying to make an excuse for their actions. but after they leave. Another worker enters to set up the lighting for the statue's exhibit and he could care less about it. The worker lights a cigarette, blows smoke on the statue and the 3,000 pound figure just falls over on top of him. This brings "Inspector White" out again and "Pimm" expresses his belief the two deaths might be murder. That leads to the newspapers running headlines about the killer statue's "Curse" and long lines of people wanting to see it. Which actually upsets the museum's manager. The manager informs "Pimm" that he is getting a raise of three pounds a week, but not the curator's job he wanted. It will go to a more senior man and also the statue is being sold to a New York Museum. The representative from the New York Museum arrives to authenticate the Golem. Talking to "Pimm", "Jim Perkins" played by Paul Maxwell, tells the other man the legend of the Golem. While speaking "Perkins" finds the Hebrew name "Judah Loew" on one side and on the opposite the same wording "Harold Grove" had seen. "Perkins" asks "Pimm", if he had done a rubbing to copy the inscription for translation and is told no. "Pimm" decides to do a rubbing and takes it to a "Rabbi". The "Rabbi" is concerned about what he has translated and asks "Pimm" about its source and is told. The "Rabbi" warns "Pimm" that he has found the real Golem of legend and to leave it alone. Power bringeth destruction; beware, lest it be unleashed. He who will find the secret of my life at his feet, him will I serve until beyond time. He who shall evoke me in the 17th century, beware, for I cannot by fire be destroyed. He who shall evoke me in the 18th century, beware, for I cannot by fire or by water be destroyed. He who evokes me in the 19th century, beware, for I cannot by fire or by water or by force be destroyed. He who in the 20th century shall dare evoke me, beware, for neither by fire, nor water, nor force, nor anything by man created can I be destroyed. He who in the 21st century evokes me must be of God's hand himself because on this earth the person of man existeth no more." "Pimm" finds the hidden scroll in the Golem's right foot and brings it to life. 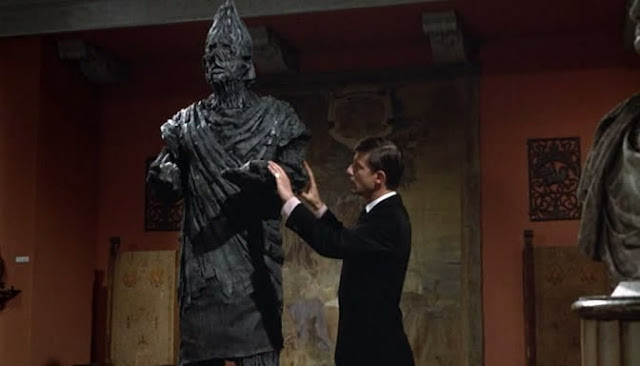 In walks the new curator and "Pimm" still not believing he controls the statue in rage orders it to kill the other man. The statue walks off the stand, lifts it arm up and brings it down on the curator's neck. As the story progresses "Ellen" and "Jim" are falling in love. "Pimm" convinces "Ellen" to join him for lunch and tries to get the girl to go to the French Rivera with him. As they talk she makes mention of the bridge across the waterway they eating beside. "Pimm" makes the remark that he can bring the bridge down. The same night using the Golem he destroys the bridge and calls "Ellen". "Pimm" thinking he can destroy the Golem makes the mistake of ordering it to swallow the scroll. Now, as he will find out later from "Jim Perkins", there is no way to stop the Golem. 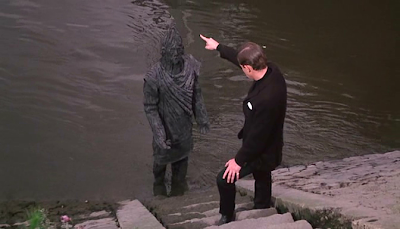 He orders the statue to walk into the deepest part of the Thames River. The next morning thinking the Golem is destroyed "Pimm" comes to work, now as the museum curator, and calls the head of security to ask if everything is all right. He's told nothing usual has happened and walks to the room where the status was on display and finds the Golem in its place. Next he tries to burn it forgetting that it was in the warehouse fire to begin with. Things progress and "Inspector White" feels "Pimm" is behind the deaths, but has no evidence. While "Jim Perkins" believes "Pimm" may have brought the statue to life and gets him to confess. He also confesses to having had the statue swallow the scroll making it impossible for any person to stop it. "Inspector White" was in hiding, heard everything, and has "Pimm" arrested and committed to an asylum. From his room "Pimm" mentally calls the Golem and is freed He next kidnaps "Ellen" and takes her, his mother and the Golem to "The Cloisters". A building owned by the museum out in the countryside. This all leads to the climax with the military now involved. 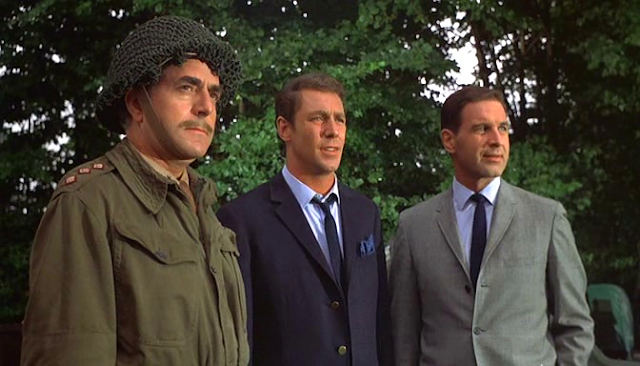 Below left to right: Tom Chatto as the "Army Officer", Noel Trevarthen as "Inspector White" and Paul Maxwell as "Jim Perkins". "Pimm" instructs the Golem to guard the gate and kill anyone that tries to enter. First the military attempts to shoot the statue without success. 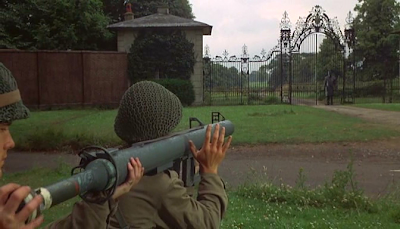 Next they use a bazooka followed by a howitzer. Both without scratching the Golem. Then being the military authorization to use a small nuclear device is given by Palriment. Explaining there nothing to worry about, because the device only has a radius of one square mile and they've evacuated five square miles. In the end "Ellen" is rescued at the last moment and the nuclear bomb is set off. There is no question "Pimm" and his "Mother" are no more, but when the bomb blast is clearing and all eyes are on the target. The Golem is still alive and walks toward the Atlantic Sea board to end the film. 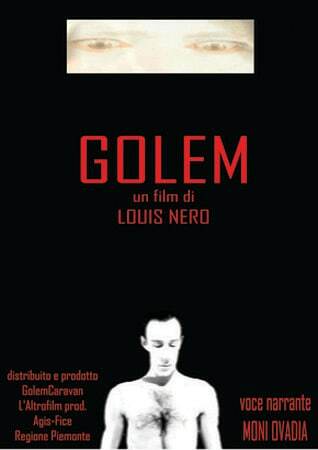 In 2000 Italian director and screenplay writer Louis Nero filmed an updated, but period remake of the 1920 "The Golem: How He Came Into the World". As to the film's plot/ I could only find the following on IMDb and it appears to be by Louis Nero himself, but there is no name showing or the source. Golem is a feature film shotted in digital-beta. I have used external of Turin and Praga and Lion, taking advantage me of the contribution of the Piemonte Region and the great availability of the Jewish community of Turin that has kindly granted to me to have use of the synagogue for some scenes. It is cinema of search, therefore careful to the language, it is video - art in the aesthetic search, it is spreading of one important culture. I have used actors of theatre interested to the thematic discussed like Moni Ovadia, I have tried to photograph Praga in order to discover the essence, but above all I have tried to penetrate in one immense simbology. I am inspired to Greenaway and the video-art, having known well. The variants of the golemlegende introduce the golem like a dumb one puppet with stature from giant, we think to the reading of Wegener of the romance of Meyrink in "der Golem, wie er in die Welt kam" where the scenography of Poltzig inspired to the espressionism concur to create a mysterious atmosphere rich of references to the cabalistic enigmas. The concept of "gòjlem", but, implies also a something of unfinished, embryonic. In talmud a woman who has not still conceived or a water jug that has need of smoothing defines "golem". How many legends can boast therefore a great symbolic field? The golem that it traces the myth of Adam, the golem put molding on from the Rabbi Low who in order to give life to the colossus reads piece of the Sefer Jezira and slip it into mouth the schem, the golem Polish that in face it has written "emet" and in order to make to die it is only necessary that to cancel the first letter, it is a symbolic image of the way towards the redemption, the materialized collective spirit of the ghetto, he is who saves the Hebrew from the pogrom, is the dream of the man of become Jahve Elohim, the passion that grows to excess and destroys the man, the creation that exceeds its actor. It is dream, therefore material cinematographic for excellence, decomposition and dealt entirety resetting therefore with a division of the scenic picture, field-versus field that it creates the fragmentarines of all. A evocative cinematographic image as it is the figure, like it is the legend, a digital creation, essentially a history that it must be told, have ud also with the insertion of the hypertext, with the same impalpable consistency who have the hallucinations. I also know that Richard Arthur portrayed "Rabbi Yehudah (Judah) Loew". Instead of "Rudolph II" the cast list indicates Mark Yungblut as "The King of Bavaria".So the story apparently takes place in Germany rather than what became Czechoslovakia. The rest of the characters making up a total of 12 actors in the picture portrayed characters with names such as :Yitzchak Katz", "Caine", and "Tycho Brahe". There are other motion pictures using the idea of a "Golem", but not in the religious sense of these films or the concept. All eight of these films, as of this writing, appear to be the only one's referring to the Biblical "Gaimi (My Golem)" and it's power. A power that depending upon my readers beliefs comes directly from "The Word of God" "EMET"!